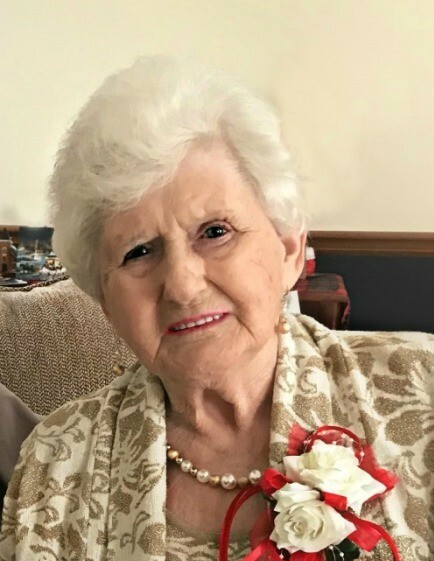 Martha Rutledge Channell of Conyers, GA, passed away on Sunday, July 1, 2018 at Piedmont Henry Hospital in Stockbridge, GA at the age of 82. Born September 10, 1935 in Bethlehem, GA, she was the daughter of the late Guy Sylvester Rutledge and Mae Murphy Rutledge. Martha graduated from Greensboro High School. On December 7, 1952, she married James Rayford Channell, Sr. They moved to Conyers, GA in 1972 where she worked with her husband at Moseley Furniture Company until she retired in 2014. The things she enjoyed most were her flowers, reading, watching humming birds and especially being with her grandchildren and great grandchildren. She was a member of the First United Methodist Church of Conyers, GA.
She is survived by her husband, James Rayford “Ray” Channell, Sr. of Conyers, GA; two daughters, Theresa Channell Ray and her husband Dan of Conyers, GA and their children Meredith Ray of Memphis, TN and Brittany Ray Norton and her husband Allen and their children Macie and Mason of Monroe, GA, and Jane Channell Davis and her husband Clint of Conyers, GA and their children Cody Davis of Conyers, GA and Joshua Davis and his wife Tanya of Loganville, GA; son, James Rayford “Ray” Channell, Jr. of Milton, FL, a number of other relatives and many friends. She was preceded in death by a son, Marvin Fred Channell. Funeral Services will be held Thursday, July 5, 2018 at 4:00 p.m. at McCommons Chapel in Greensboro, GA 30642 with Rev. Mark Barbour officiating. Interment will follow in Liberty United Methodist Church Cemetery, 3091 Liberty Church Road, White Plains, GA 30678. Serving as pallbearers are Cody Davis, Josh Davis, Allen Norton, Alvin Dowdy, Antonio Johnson, Chuck Connolly and Master Mason Norton. Serving as Honorary pallbearers are the staff, caregivers and nurses at Benton House Memory Care. The family will receive friends Thursday afternoon from 3:00 p.m. to 4:00 p.m. at McCommons Funeral Home. The family requests that any donations be made to Alzheimer’s Association - Georgia Chapter, 41 Perimeter Center East, Suite 550, Atlanta, GA 30346. McCommons Funeral Home, 109 W. Broad St., Greensboro, GA, (706) 453-2626, is in charge of arrangements. Visit us at www.mccommonsfuneralhome.com to sign the online guest register.